Flu shots are available for UGA students, faculty/staff and faculty emeritus beginning Wed, Sep 5. A valid UGA ID and a current insurance card* are required. UHC will file with insurance. *If you do not have insurance, payment can be made by cash, check, or card at the cashier’s desk following the flu shot. Students may pay online. Or you may visit your local Health Department. Flublok is an egg-free flu vaccine for those who have been avoiding getting the flu shot due to an egg allergy. Request a #FluGA Moblie Clinic to come to your department/organization. If you cannot make an appointment within your Medical Clinic, you may schedule one with the Allergy / Travel Clinic. Flu shots will also be available during regular office visits. Schedule an appointment by phone in the Allergy / Travel Clinic—706-542-5575. Should I get vaccinated for the flu? Anyone who does not want to become ill with influenza should consider getting vaccinated. This is especially important for certain subgroups such as pregnant women, those with obesity, chronic lung diseases such as asthma, and other disease or taking medications which suppress the immune system. The best way to prevent the flu is to be immune to the viruses. The preferred way to do that is to get the flu shot. Avoiding exposure to the flu is helpful but is very difficult. Ways to avoid contracting the disease include: wash your hands or use hand gels containing at least 60% alcohol; do not touch your face, eyes, mouth unless your hands are clean. Avoid contact with an infected person. Sick people can help by not spreading the virus. Do not go out unless medically necessary and then wear a surgical mask. Sneeze or cough into the mask or a tissue, then discard the tissue in the trash. Remain isolated from others ideally for 7-8 days after becoming symptomatic. Use proper cough and sneezing etiquette and cleanse your hands after coughing, sneezing or blowing your nose. Can anyone get the flu? Anyone can get the flu, but the disease is more severe for some people. Most people who get the flu will recover in 1 to 2 weeks, but some people will develop life-threatening complications (such as pneumonia) as a result of the flu. Millions of people in the United States - about 10% to 20% of U.S. residents - will get the seasonal flu each year. An average of about 36,000 people per year in the United States die from the flu, and 114,000 per year have to be admitted to the hospital as a result of influenza. Serious problems from flu can happen at any age. People > 65 years old, people of any age with chronic medical conditions, and very young children are more likely to get complications from seasonal flu. Pneumonia, bronchitis, and sinus and ear infections are three examples of complications from flu. The flu can make chronic health problems worse. For example, people with asthma may experience asthma attacks while they have the flu, and people with chronic congestive heart failure may have worsening of this condition that is triggered by the flu. How is the influenza virus passed around? The flu is spread when a person who has the flu coughs, sneezes, or speaks and sends flu virus into the air, and other people inhale the virus. The virus enters the nose, throat, or lungs of a person and begins to multiply, causing symptoms of the flu. Flu may be spread when a person touches a surface that has flu viruses on it - a door handle, for instance - and then touches his or her nose, eyes or mouth. The Flu Is Contagious. A person can spread the flu starting one day before they feel sick. 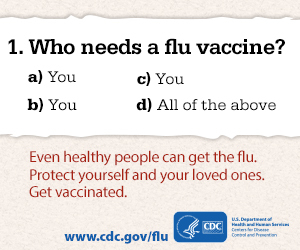 Adults can continue to pass the flu virus to others for another 7-8 days after symptoms start. Children can pass the virus for longer than 7 days. Symptoms start 1-4 days after the virus enters the body. Some persons can be infected with the flu virus but have no symptoms. During this time, those persons can still spread the virus to others. Your respiratory illness might be the flu if you have sudden onset of body aches, fever, and respiratory symptoms, and your illness occurs during November through April (the usual flu season in the Northern Hemisphere). If you have these symptoms during the H1N1 pandemic time, it is much more likely that you have influenza than other virus infections. However, during this time, other respiratory illnesses can cause similar symptoms and flu can be caught at any time of the year. It is impossible to tell for sure if you have the flu based on symptoms alone. Doctors can perform tests to see if you have the flu if you are in the first few days of your illness, but these test are not highly sensitive have many limitations. Self-isolate and only go near others or in public if you must for medical reasons. Then you should use cough etiquette and wear a surgical mask. If you live in a residence hall on campus we ask that you consider going to your permanent home if possible until you have recovered. You may be able to resume activities when you have not had a fever for at least 24 hours without taking medications known to lower your temperature. A virus causes influenza, so antibiotics (like penicillin) don’t work to cure it. Antiviral medications have been shown to decrease the severity of the illness and duration of symptoms by 1 - 1 1/2 days. These medications are primarily used for people at high risk for complications of influenza. High risk people are are those who are pregnant, the very young, or have chronic diseases such as asthma, or are over age 65. The best way to prevent the flu is to get an influenza vaccine (flu shot) each fall, before flu season. Never give aspirin to children or teenagers who have flu-like symptoms - and particularly fever - without first speaking to your doctor. Giving aspirin to children and teenagers who have influenza can cause a rare but serious illness called Reye syndrome. Children or teenagers with the flu should get plenty of rest, drink lots of liquids, and take medicines that contain no aspirin to relieve symptoms. Who should seek medical attention? What are the risk groups? Most people with the flu can manage recovery at home with little or no medical attention. However, some people are at higher risk of serious flu-related complications. Any sick UGA student desiring medical treatment should make an appointment with their PCP or another clinician on their team. After regular hours they should go to the Urgent Care Clinic during usual evening and weekend hours. People who have the flu and develop any of the following symptoms should call a health care provider without delay for medical advice or attention. What is the myth of the “Stomach Flu”? Many people use the term “stomach flu” to describe illnesses with nausea, vomiting, or diarrhea that are not caused by the flu virus, but can be caused by many different viruses, bacteria, or even parasites. However, while vomiting, diarrhea, and being “sick to your stomach” can sometimes be related to the flu - particularly in children and with an H1N1 flu infection - these problems are rarely the main symptoms of influenza. The flu is a respiratory disease and not a stomach or intestinal disease.